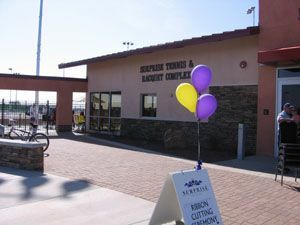 The Surprise Tennis & Racquet complex is hosting a $25,000 USTA pro circuit event January 13-20, 2008. The complex is also hosting 3 qualifying events to earn places in the tournament. One is a tournament for only girls 14-18 yrs old from the southwest section. The winner will receive a wildcard into the qualifying tournament for the pro circuit event. The second one is for adult players and they can earn a wildcard into the qualifying for the event and the final one is for any US junior and the winner will receive a wildcard into the main draw of the tournament. These tournaments will be held January 5 and 6 and can be entered online through tennis link. The qualifying for the main draw starts on Sunday, January 13 and runs through Wednesday, January 15. Main draw play starts on Tuesday, January 14. Tickets are free for the qualifying and are only $2 for Tuesday through Thursday and $5 for Friday, Saturday and Sunday. For more information contact John Austin at John.Austin@surpriseaz.com or call 623-222-2420.